The release of stress from a bent tube upon completion of the bending process. 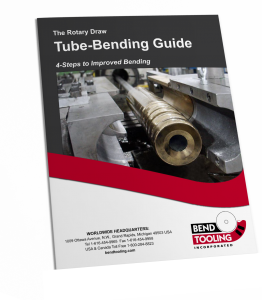 To the extent that the tube’s intrados has not been completely compressed or its extrados elongated while under the stress of the bending process, the bend will open up afterwards with two effects. One is radial growth, which see. The other is an increase in the degree of bend. Because radial growth is seldom critical, it is the second springback effect that garners the most attention. This second effect is readily offset by “over-bending” the tube — that is, exceeding the specified degree of bend by three to eight percent — so that it will open up to the desired degree of bend once off the machine. Material rigidity, “D” of bend, and wall factor are the key factors in springback. However, there are other factors, such as machine set-up, that can intervene, and there exists no comprehensive guide as to how any of these factors combine to produce a predictable measure of springback. Therefore, with each new application, trial-and-error remains the quickest way to determine the amount of springback that will occur with that application.